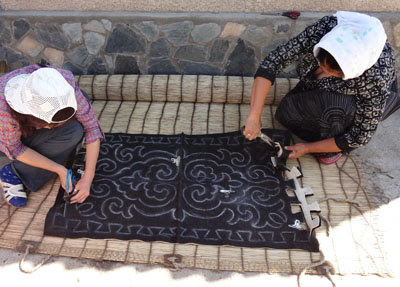 Part #1 provided background information on Kyrgyz felting and patterns. This installment looks at the process of making the carpet. 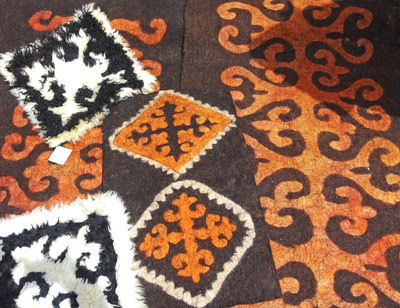 Shyrdaks and Ala-Kiyiz are Kyrgyz felt carpets, handmade using patterns and sewing techniques handed down through generations. 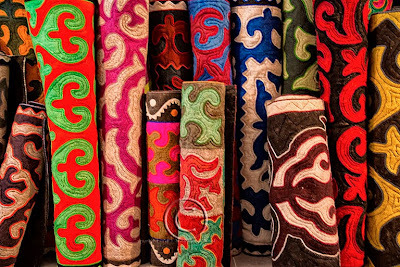 The exceptional expressiveness of Kyrgyz felts is marked by the singularity of pattern arrangement and combination of colors. These carpets are listed on UNESCO’s list of Intangible Heritage of Humanity. 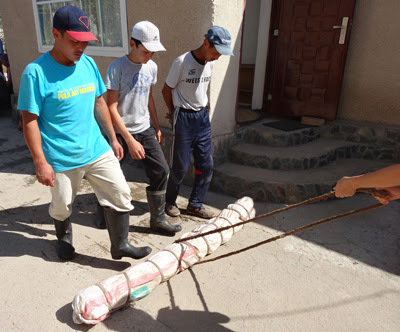 On an Uzbek Journeys tour we visit the home of famed felter Mairam Omurzakova, a founding member of the Altyn Kol cooperative, Kochkor, in the northern province of Naryn. After a delicious lunch in her home, Mairam steps visitors through the felting process. 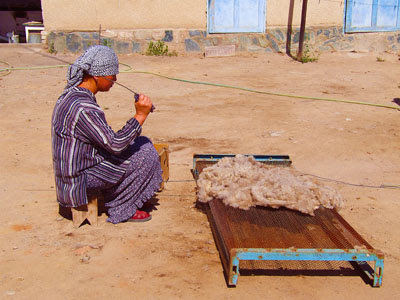 Her cooperative mainly use fleece from Karakol sheep. This wool is quite coarse, however, it is well suited for making felt carpets. Sheep are usually fleeced in autumn: the wool from the autumn shearing is considered to be finer and more valuable. 1. First the fleece is placed on a cow’s hide. Then it is beaten with special metal sticks. This helps to separate the fibres evenly, to make the wool fluffy and, to some extent, clean it. 2. The wool fibres are then laid out on a chii (reed mat) in several layers. 3. Next, the wool is dampened by hot soapy water, and this is followed by rolling up the reed mat, then tying the mat in several places. The reed mat with the wool inside is then wrapped up in a fabric. 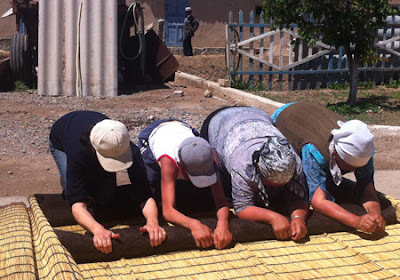 (This fabric protects the mat from being damaged during the dragging and kneading process). 4. Family members then kick the roll or tie it to a horse to drag. This activity, the main stage in felting, helps to meld the fibres together. It is done for at least an hour. 5. Next the roll is unwound and the wool is kneaded manually; it is rolled back and forth, from wrists to elbows and back to wrists. 6. Then the wool is turned over and the opposite surface is processed in the same way. This process, which takes some hours, is repeated several times to ensure the felt is absolutely firm and the edges are finished. 7. Finally, the finished felt is rinsed in cold water and put out to dry. To produce a felted piece measuring 3 x 1.5 metres, 12 kilograms of wool are required. After kneading, the finished felt weighs no more than 6 kilograms. Maraim’s family also uses appliqué techniques on shyrdaks. These are based on creating positive/negative visual images. The felt is cut into pieces, then two contrasting coloured layers of felt are placed on top of one another. A design is drawn freehand in chalk on the top layer, cut out, then stitched so that the background and the pattern are contrasting colours. The results are stunning. What is also impressive is the joyful atmosphere the women create as they work together in Mairam’s sunny courtyard. Lots of gossiping and laughter. Ala-kiyiz carpets are less durable than shyrdaks - the latter should last up to 50 years. However, ala-kiyiz items are faster to produce and are made by pressing and rolling patterns into the felt. The pattern is marvellously vague and the carpets warm and soft to walk on. This technique is also popular for home decorations. As well as visiting Mairam’s family and watching this process, other felt studios are included on an Uzbek Journeys tour. e.g., a visit to Aidai Asangulova’s, a cutting edge contemporary felter who specialises in nano felting.